France has reacted frostily to the Dutch government's sudden purchase of a stake in Air France-KLM in attempt to counter French influence. Shares in the airline company fell 11% after the Netherlands government said late on Tuesday it was acting to protect "Dutch interests". The Dutch bought a 14% stake, aiming to match France's 14.3% share. French Finance Minister Bruno Le Maire insisted the company should be "managed without national public interference". The Dutch move began late on Tuesday, with an initial acquisition of 12.7% of Air France-KLM shares. According to French reports, the government in Paris was informed of the Dutch move only an hour before a press conference on Tuesday night, and after the shares had been bought. A ministry source told AFP news agency the Dutch move was both "surprising" and "unfriendly", more in the manner of market traders than a state shareholder. The Dutch government then upped its stake on Wednesday to 14%. French President Emmanuel Macron said the Dutch government should "clarify its intentions". "Buying this stake ensures we have a seat at the table," Dutch Finance Minister Wopke Hoekstra said of the initial move, which cost about €680m (£583m; $774m). By the end of Wednesday it had spent €774m. The justification, he said, was to protect Dutch economic interests and jobs - particularly regarding Amsterdam's Schiphol airport. Schiphol is Europe's third busiest airport after London Heathrow and Paris Charles de Gaulle. KLM is more profitable than its French counterpart and retains much public support for its reputation as the national carrier. The monarch of the Netherlands, King Willem-Alexander, even serves as a co-pilot on the company's planes on a regular basis to maintain his pilot's licence. There was widespread political support in the Netherlands for the secret share-purchase. Centre-right CDA leader Sybrand Buma said it was of "great significance for a solid future for KLM". Mr Hoekstra is expected to meet his French counterpart later in the week, which French government spokesman Benjamin Griveaux predicted would be a "frank but friendly, but especially frank" discussion. Air France-KLM was formed out of a merger of the two national flag carriers in 2004 - though the airlines themselves have continued to operate under their own separate banners. Until now, the Netherlands held only a 6% stake in KLM - the smaller subsidiary - while France owns 14.3% of the parent company. The surprise move from the Dutch came after a series of disagreements in which the Dutch felt they did not have enough influence in the holding company, which was deciding strategy. Disagreements between the holding company and KLM management - mainly about the autonomy of the Dutch airline - have been made public in the past year. Strikes in France in 2018 caused company-wide losses, much to KLM's frustration. A Canadian CEO, Ben Smith, was appointed at the holding company and seen as trying to assert greater authority over the Dutch subsidiary. In recent weeks, reports emerged that the position of KLM's CEO Pieter Elbers could be under threat because of his vocal support for keeping the two operations separate. Last week, the group announced a "goal of simplifying and improving the governance", part of which involves increasing collaboration. French financial newspaper La Tribune characterised the sudden move by the Netherlands as a "thunderbolt" while Le Monde saw it as a "stock market blitzkrieg". 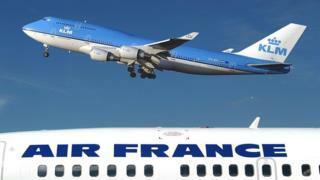 The Air France-KLM board of directors was expected to meet on Wednesday to discuss the fallout. Delta Air Lines and China Eastern Airlines each hold a 8.8% stake in the company.